This was the BEST $0.99 Hubster ever spent. He found it by chance at Walgreen's at the check out. 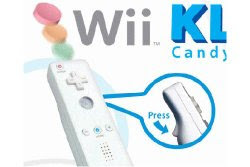 Baboo now has her OWN Wii remote that doesn’t restart games or screw with people’s minds. We make appropriate cheering noises when she does her “turn” and she’s happy. Last night she yelled ‘ I WIKE IT! Mama, wook at me! My Turn! My Turn. I did it! I did it!”. And she can chew on it and we don’t worry about having to throw $40 in the toilet.